Zhuang Chusheng was born in 1968 in Pinghe County, Southeast China’s Fujian Province. He studied various branches of Chinese language and dialects, such as linguistics, phinology and modern Chinese. he graduated from Fujian Normal University in 1994 and received a doctoral degree in 2000 from Jinan University in Guangdong Province. In 1994, Zhuang became a teacher at Shaoguan University and later moved to the Department of Chinese Language and Literature at Sun Yat-sen University in 2005. Currently, he is a professor of Chinese language at Sun Yat-sen University and a council member of the Chinese Dialect Society. 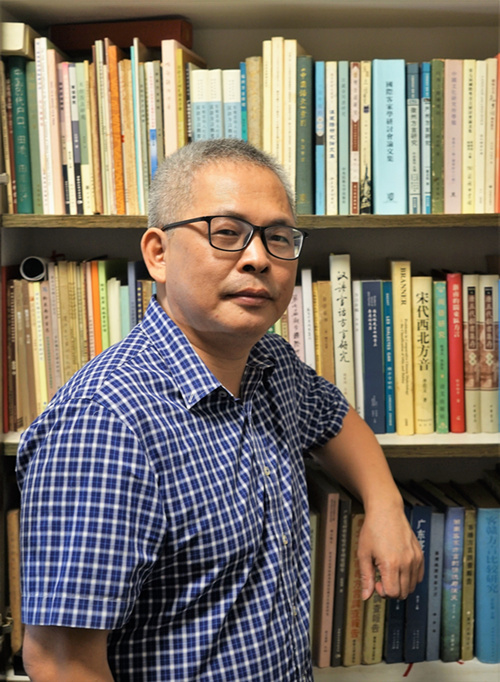 His work focuses on Hakka and other dialects spoken in northern Guangdong Province and Hong Kong’s New Territories as well as the Min dialect spoken in six Chinese provinces and Southeast Asia. Recently, he has focused on compiling and researching documents from the Hakka diaspora overseas. Zhuang Chusheng has been captivated by dialects since the 1980s. He has focused on this research for the past three decades. Zhuang’s current project has made a number of important breakthroughs. Supported by the National Social Science Fund, the project aims to establish a global Hakka corpora that would allow for comparative studies of materials from China and abroad. Hakka is one of the major dialects of Chinese, and it is natively spoken by the Hakka people in southern China, Hong Kong, Taiwan and throughout the diaspora areas of the East and Southeast Asia as well as in overseas Chinese across other parts of the world. When he studied in Fujian Normal University, Zhuang learned dialects, phonology and other disciplines by himself out of immense interest. Linguist Li Rulong was Zhuang’s teacher when he was pursuing his master’s and doctoral degrees. Zhuang investigated phonology of dialects spoken in northern Guangdong Province in his doctoral dissertation, which has served as a prototype for research on popular stories and local dialects in Guangdong, Hunan andGuangxi provinces since its publication in 2004. Linguistic diversity has encountered unprecedented challenges against the backdrop of globalization, informatization and modernization. At this point, endangered languages have become a global issue, attracting enormous attention from the international community. A dialect island within the Chinese language is a form of linguistic enclave. Zhuang is a pioneer in the investigation and research on dialect islands of the Chinese language. His multiple achievements are important documents in the field. Zhuang joined the core panel of a project to protect China’s linguistic heritage. He directed investigations and studies of endangered dialects spoken in such places as Fujian, Guangdong and Hainan provinces as well as the Macau Special Administrative Region. In the past few years, he went to Chinese University of Hong Kong as a research associate on many occasions and conducted studies with scholars in Hong Kong on dialects used in northern Guangdong as well as six other Chinese provinces and Southeast Asian countries. The 19th century was the golden age of European linguistic sciences. Huge progress was made in the fields of historical comparative linguistics and studies of dialects and phonology. Western missionaries and Sinologists adopted Western linguistic methods to describe and analyze Chinese dialects. These studies demonstrated outstanding academic capabilities and were of great significance even though they did not intend to explore linguistics originally. Today, these documents provide precious resources for investigating linguistic features and writing traditions of Chinese dialects that existed more than 100 years ago, Zhuang said. Zhuang spent a dozen years studying these documents for his research on Hakka, Min and Cantonese dialects. His scholarly achivements include Early Documents of Two Varieties of Hakka Used in Indonesia Written and Printed by Dutchmen and the Phonetic Alphabet of Roman Capitals in Southwestern Dialect Documents Written by Missionaries. Based on Hakka documents recorded by the missionaries of the Basel Mission and field investigations, such research has explored the development process of the Hakka dialect in Hong Kong’s New Territories, having both theoretical and practical significance. Zhuang is currently focusing on collection and research on overseas dialect documents, including textbooks in Liuqiu (Ryukyu) Mandarin and various versions of the Bible translated by Western missionaries into dialects. He has also done studies on other books that reflect the linguistic environment of the Ming and Qing dynasties, with a special emphasis on dialects spoken in the South China. “Our colleagues in Japan, Europe and the United States started compilation and research work earlier than us. We have to make greater efforts to further discover, compile and research these precious materials. In this way, we shoulder the responsibility and showcase the research capability of Chinese scholars so that we can have a bigger say on the international academic stage,” Zhuang said. “Overseas Chinese-language documents have irreplaceable research value. Without them, any history of modern Chinese language will be incomplete. It is also indispensable for researching the development process of South China’s dialects and the Beijing dialect,” Zhuang suggested. History of modern Chinese language has taken on a brand-new look due to the discoveries of new scholarly information from overseas. The new corpus will definitely broaden the research scope, resolve new problems and produce fresh arguments, he added. Zhuang has emphasized the application of interdisciplinary research methods, indicating that studies of Chinese dialects should keep an eye on modern technologies while adopting research methods to investigate society, history and culture. For example, research methods of experimental phonetics, database linguistics and geographical linguistics are perfectly suitable for exploring Chinese dialects. Methods and technologies of experimental phonetics have been widely applied to linguistic investigations and research. Subjective experience used to play a huge role in dialect studies. Scholars should continuously combine the traditional method with that of experimental phonetics in a proper way with the intent of precisely describing and summarizing the phonetic system of each dialect. In this way, subjectivity and arbitrariness can be avoided. The primary task of dialect scholars is to provide detailed and reliable linguistic materials. Corpora linguistics is a new interdisciplinary science that emerged in the 1980s. Researchers need to establish audible corpora by collecting, compiling and storing corpus of Chinese dialects used domestically and overseas. Zhuang said that this project is of great academic value for digitizing research and studies of Chinese dialects. Dissemination, inheritance and protection of dialects and relevant cultures also benefit from the work. Geographical linguistics, from the perspective of geography, aims to study internal differences and the geographical distribution of languages or dialects by drawing maps. The extensive application of geographical information systems to various disciplines has lent great support to geographical research of Chinese dialects. Zhuang suggested scholars make full use of geographical information systems by inputting, storing, searching and analyzing data on computers and the internet to facilitate comprehensive comparative studies of dialects. Modern sciences and technologies are advancing all the time. Linguistics, in the era of big data, needs to adopt methods of other disciplines rather than stay narrow-minded and restrict itself to a limited area. “A lot of universities in the developed countries have opened linguistics as a major that combines social sciences and natural sciences. Linguistics is also a pioneering subject of humanities and social sciences,” Zhuang said. He noted that only a handful of Chinese universities offer linguistics as a major. Linguistics in China requires more prestige, he said. “Studies of Chinese dialects is a third-tier branch of linguistics that receives little attention,” Zhuang added. Studies of Chinese dialects explore phonetics, vocabulary, grammar and pragmatic issues while touching upon other overlapping fields of social and natural sciences. It includes almost all branches of modern linguistics. Scholars that study grammar, history and linguistic styles of Chinese languages are paying growing attention to the research outcomes of Chinese dialects. The world’s diversity of language faces a major challenge in the process of globalization. Zhuang pointed out that languages of China’s ethnic minorities and Chinese dialects are vanishing. In addition to linguistic scholars, the public and governments have gradually realized the importance and urgency of protecting linguistic resources. “In the context of rapid urbanization, local accents stir strong feelings of homesickness. Dialects are an important embodiment of culturally psychological identity, having an active role to play for cultural development and emotional convergence. Also, dialects are crucial for inheritance of legacies of ethnic culture because they embody cultural connotation of regions,” Zhuang argued. In most cases, the disciplines that draw little academic attention have the responsibility to record memories of a country and pass them onto post generation, and to introduce its culture in the global context. They are often distinctive disciplines of a country or a region. It is easier for the world to recognize and embrace it because it has the symbolic meaning of a nation. At this point, we should treasure and promote these disciplines at a time when China’s revitalization has reached a crucial stage.